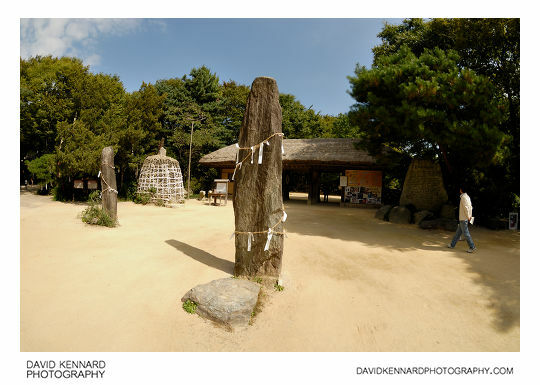 This post is part of a series on my visit to the Korean Folk Village on the fourth day of my Holiday in Seoul, Korea. If you haven't read the first part, that's here: Korea Day 4 Part 1 - Seoul Metro. 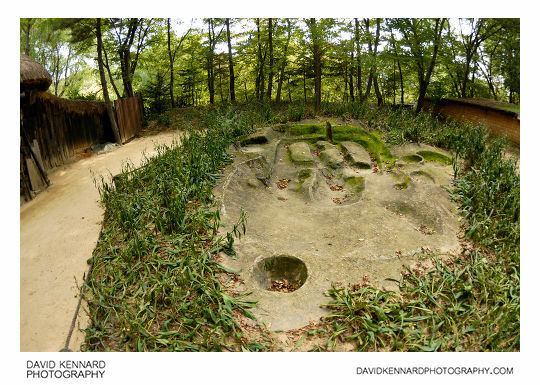 When you get into the Korean Folk Village, quite near the entrance there is a large number of eartheware jars. 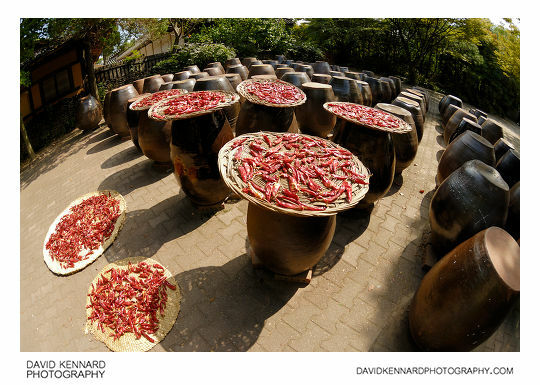 At the time we were there, they were also drying chili peppers on mats. Unfortunately for the above photo I forgot to bracket my shot, and so some of the mat and the highlights on the chilis are blown out and overexposed. A bit further along, and there are two standing stones and a large mound of stones, all covered in small bits of white paper. The bits of white paper are buddhist prayers that people write and then tie onto the string wrapped round the stones. 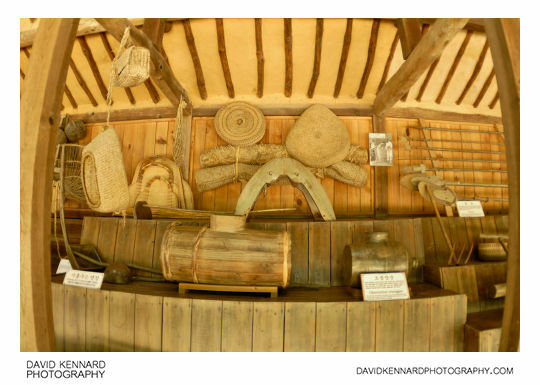 Below we have some of the tools that Korean farmer's used to use. Unfortunately I didn't have the ISO on my camera set high enough, which resulted in a long shutter speed and blurry photo. Farmers also collect liquid fertilizer in either a round pitcher (ojum tok) or in a "rice bale"-shaped ojum changgun, with a small mouth affixed to its side. The latter is similar to, but larger than, the liquor container called sul changgun. You wouldn't want to get your ojum changgun and sul changgun mixed up! This next photo, I had a hard job working out what it is of. Although I took a photo of a sign explaining the area, the sign was in Korean. I don't know Korean, and Google Translate is pretty rubbish at tranlating Korean to English. As far as I could work out, it is an excavation of an old Korean building that was made at the nearby city of Dongtan New Town. Which doesn't make much sense, and I'm pretty sure Gyeonggi Province isn't located on Mars. 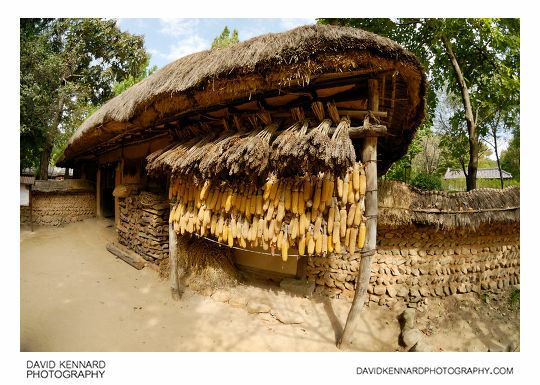 This next photo is outside a Commoner's house from the central region. 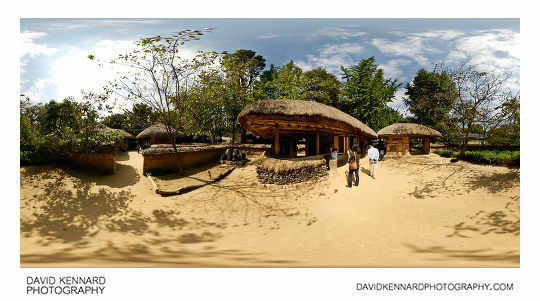 The Korean Folk Village website calls it a Farmer's House, while the information board outside the house calls it a Commoner's House. And the information leaflet just calls it a House. I think that probably in the late Joseon period (19th century) a Commoner and Farmer were both the same thing. Next we went to look at the lake and flat stone bridge.